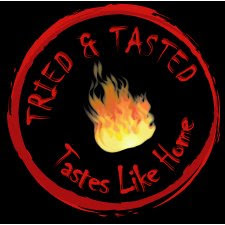 Tried & Tested is a new event series started by Zlamushka of Zlamushka’s Spicy Kitchen, where each month a blog is highlighted and we get to try recipes from that blog. This month Cynthia’s blog Tastes Like Home is in the limelight. Cynthia has some wonderful recipes, and with every single post she seems to have something new to offer to her readers. I had bookmarked several of Cynthia’s dishes before and this was a perfect chance to finally try those recipes. I decided to make the Tomato Choka first, the simplest recipe I’ve tried yet packed with all the flavour. I also tried these warm delicious Cheese Scones. I sprinkled a pinch of crushed pepper on a few. These were perfect for the evening with a cup of tea. The scones were very easy to make and were done in no time. If you would like the recipe too, please email Cynthia over at her blog. Both of them looks delicious. Make something Yellow for Bee's click, did you see her post on Bri? y'day I was reading about choka, looks yummy. I should try it soon. Scones looks good too Nams. Nice event, never knew it. Hey just now saw mango scones in Kalai's blog and cheese scones in urs...gr8 recipe,looks yum. The chokha and scones look lovely ..Nice pick!! looks so delicious,..specially the scones,.. Yummy!!! What a great blog for the first T&T... You picked some great foods to cook, everything looks awesome! Everything looks so wonderful! Really yummy. Thsoe cheese scones look delicious !! I like your chunky version, looks much more filling and the cheese scones, the flecks of cheese make them so very yummy!